This article explains some of the benefits and pitfalls of using analogies in science engagement, especially when it comes to engaging people with complex topics like genomics. 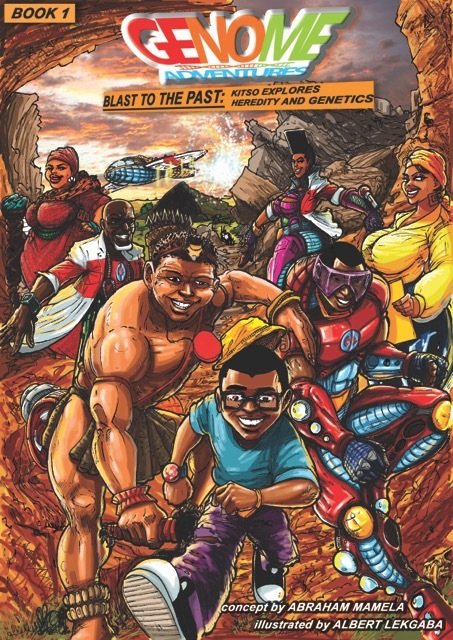 It tells how analogies were used in the Genome Adventures project, which aimed to engage the general public and in particular school students in Botswana with genomics and biomedical research through a comic book series. Read more about the project in the Mesh Genome Adventures project report. Analogies are an effective tool for explaining very technical or complex subjects in science. They create a natural way in to difficult subjects by relating them to ideas people are already familiar with. However, it is important to exercise caution when using them. If not developed sensitively, analogies can create or further entrench misconceptions or stigma. It is important not to underestimate your audience or how fast they are likely to understand concepts when developing analogies, so before you resort to analogy, know your audience. Make sure you have a good grasp of their current level of understanding so you do not patronise or further confuse them, and have a good idea of the cultural or traditional backgrounds your audience have as this will help you to conceive of analogies that are relevant and thus more effective. Analogy was a very natural way to engage the audience of the Genome Adventures comics with the complex science of genomics because, as a medium, comics give license to be experimental and creative; shrinking characters to zoom in on the inner workings of the body, for example. Several analogies were used to explain technical concepts in the comics, two of which are described below. Caption: Video of Abraham Mamela, creator of Genome Adventures, describing the project and the use of metaphor within it. When explaining the CCR5 mutation inside a cell, the cell is likened to a door handle with a keyhole and the HIV receptor to a key. For someone to get HIV they need to have a key that matches the keyhole on the door handle. People who have the CCR5 mutation and cannot be affected by the HIV virus still have the door handle, but no keyhole for the HIV key so the HIV cannot be "unlocked". In a town, there is a need for a power plant to supply electricity, a recycling plant for waste, a library where information is stored, banks and ATM machines, and transportation. A human cell can be described in a similar way with a nucleus likened to a library, mitochondria to a power plant, and lysosomes to a waste recycling plant. The content on this page forms part of the online report for the 2017 International Engagement Workshop "It's Complicated: navigating scientific complexity in public and community engagement". To read more about metaphor and visualisation in engagement visit the metaphor and visualisation theme from the workshop. To read more about complexity in genetics and genomics engagement visit the genetics and genomics theme from the workshop. To read more about the full workshop and access the rest of the report including video presentations, discussion summaries, and tools, visit the workshop page.